1. Put the chickpeas, 4 tbsp oil, garlic, harissa and tahini in a food processor and pulse until combined but still coarse. Add a squeeze of lemon juice and season. 2. Use a vegetable peeler to pare ribbons from the courgette. Toss in a bowl with the remaining 1 tbsp olive oil and lemon juice and season. Drain, reserving the liquid. 3. 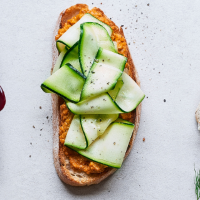 Toast the bread, then top with the houmous and drained courgette ribbons. Spoon over a little of the drained liquid and a splash more oil, and grind over with black pepper. This recipe was first published in Wed Feb 15 10:30:54 GMT 2017.